Dr. Paul Drouin has explored and successfully integrated aspects of alternative natural healing practices and evaluation techniques with conventional medicine to provide the best outcome for his patients, dedicating his life to the promotion of natural health, the prevention of disease, and to bringing a greater depth and understanding to Creative Integrative Medicine. Note to Students who currently have the original “IM-600 – Homeopathy Training” course: No further action is needed. Your personal course site will be updated with this new version. 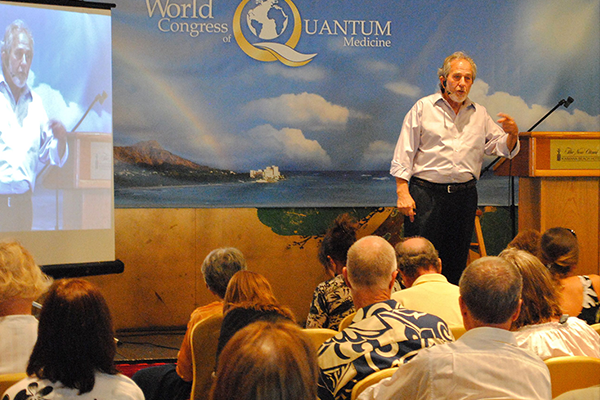 This course is part of Quantum University’s Bachelor in Holistic Health Sciences (BHS) program. Integrative Medicine is becoming a popular concept today that is not unfamiliar to conventional medicine. But without a detailed explanation of the underlying concepts that allow a practitioner to embrace multiple modalities of energetic healing and strategies to implement a new vision of the human being based not on disease but on full potentiality, the label “Integrative” will be only superficial. In this revolutionary course, the student will acquire not only precise concepts of the principles of quantum physics that allow a larger view of reality, but will also gain the ability to integrate multi-dimensional approaches of healing in a model of the human being that encompasses the materialistic point of view of Western medicine. The student will learn how to evaluate clients not in fatalistic terms of disease, but by recognizing the parameters of health and how to blend different modalities of healing that address the subtle bodies – Supramental, Mental, Vital, and Physical – opening new dimensions of healing. The concept of homeopathy will also be reviewed and revised through new technologies issuing from research in quantum physics, revealing how we can get better results. Integrative Medicine will become real through what we call Creative Integrative Medicine, a vision of modern medicine that allows the integration of ancient, conventional, and modern models of healing. You will be amazed how the medicine of the future will look as we refine our observation of the individual from a broader and deeper point of view, applying the elements of quantum physics to the field of Integrative Medicine. This course is an opportunity to update your model of healing and knowledge in health care, no matter whether you are from the medical field or from the domain of wellness. 1. Students will be able to describe a larger concept of Integrative Medicine, called Creative Integrative Healthcare Training (CIHT), learning essential principles such as entropy, subtle bodies and their transformation into higher modes of functioning, and acquiring a more scientific blueprint in resonance with quantum physics. 2. The student will be able to define the core principles of subtle anatomy and morphogenetic fields that will be presented in this course. The participant will be exposed to the downward causation model, the only concept that can integrate multidimensional realities. Higher frequencies and healing approaches addressing the Physical, Vital, Mental, Supramental, and Bliss bodies will be also discussed. 3. The student will identify the challenges of working with clients suffering from low energy and chronic conditions, a major problem in energetic healing. Tachyonic Technology and Pulsed Electromagnetic Technology will be described, as well as how they can synergistically work together – a totally new concept. 4. The student will recognize how the underlying geometry of the fabric of space-time that can be related to tachyonic technology intelligently reconnects the physical to the more subtle bodies. The student will be fascinated by the plasticity of the blood and how this milieu can indirectly reflect subtle energy outcomes. 5. The student will define homeopathy and provide a new explanation of how it works and how it can be enhanced through research in quantum physics. 6. The student will identify conclusive research that has been conducted and published proving the existence and effect of the powerful subtle energy of inanimate matter on molecular and even nuclear levels will be presented. Students will also describe how Western medicine can expand the frontier of science beyond the atom to the subatomic level, where we can begin to envision more than the 4% of reality that can currently be measured by conventional means. 7. Integrative Medicine cannot be a medicine of full potentiality without revising the way clients are evaluated. The student will describe in detail the systems of the Five Pillars of Health, Five Bodies, Five Elements, and Seven Chakras, as well as how they help practitioners organize and understand the subtle energetic parameters related to full potentiality and a state of positive health. 8. The healing crisis is the major side effect encountered in the energetic modalities of healing. Students will identify strategies to deal with this sometimes challenging problem. 9. Assimilation, Immunity, and Regeneration are important pillars of health and students will demonstrate their importance to maintaining health. 10. “How is your Fire?” in energetic medicine is a basic question that students will define, as well as other strategic questions that reveal important information about the effect of a person’s past experiences on their energetic state of balance. 11. Students will recognize how the fear of being unable to complete what we’ve envisioned and the inability to forgive and to let things go can be explained as factors of energetic balance. Students will describe vital body evaluation based on the large intestine, lung, bladder, and kidney meridians. 12. Students will describe how the model of evaluation used in the Five Elements system can be applied to the evaluation of the Chakras and define vital body evaluation based upon the liver and gallbladder meridians, and the chakras.